The Dominion Foundation: Emergency Preparedness for People with Disabilities. The DAC, in partnership with the WV CED and Marion County 911 Center is pleased to be providing training and emergency kits to participating families. 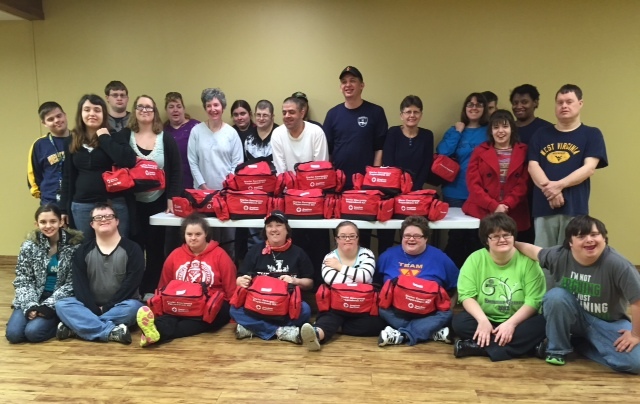 Two trainings were held in December 2014 focusing on Emergency Preparedness and Safety Skills and a Lunch and Learn and Day Camp CAN-DO in January rounded out training and distribution of kits to start 2015. To date, 27 families have benefited from the one on one assistance, training, and receiving their very own 72-Hour Comfort Kits! William and Helen Thomas Charitable Trust Grant: LIFE Project (Living Independently, Focusing on Empowerment). We will be enrolling clients into the LIFE program who are in need of assistance with independent living, home accommodations, money management, budgeting, etc and will be working with families who have an adult child at home and need assistance. The project will enroll up to 12 eligible families to provide these enhanced services and supports. Bernard McDonough Foundation: Career Readiness Program. We will expand our Career Readiness Center offerings once again by broadening our staffing support and job coaching as well as the purchasing of equipment such as laundry and lawn care equipment that will lead to developing our own small businesses and employment opportunities. This program hopes to serve an additional 10-12 individuals in reaching their employment goals. Thanks to funding in 2014 from the Foundation, the DAC placed 10 individuals in employment and provided valuable preparatory training as well as job coaching and follow-up. If you are interested in learning more about these projects or other programs at the DAC, please call the center at (304) 366-3213 and we will be happy to assist you with finding the support and resources you need!